As part of the ¡Salud A La Salud! 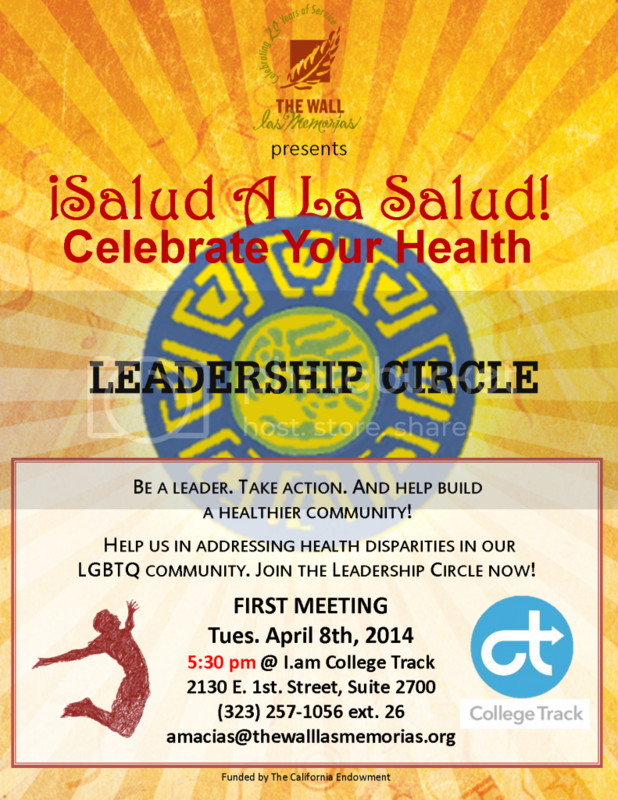 Celebrate Your Health campaign in Boyle Heights, The Wall Las Memorias is establishing the ¡Salud A La Salud! Leadership Circle to further advocate for mental health and other LGBTQ issues in our communities. Join us-- be a LEADER, take ACTION, and help BUILD a healthier community! Members of the Leadership Circle are composed of LGBTQ individuals and allies that meet monthly to provide residents with the tools in community mobilization, recruitment and creation of work plans to advocate for quality mental health programs. Members will also meet quarterly with the Los Angeles County Department of Mental Health (LACDMH) and with the Substance Abuse Prevention and Control to address the inequalities of LGBTQ health services in our communities.